Qantas seat selection does open 8 days in advance for all (although the pickings for non elite bookings can be rather slim). The flight ended up being about 80%, I ended up with two seats next to me! What's the policy with kids being on booster seas? I had an out of control kid behind me that was on one. Which of cause made there legs high engough to kick my seat back constantly! Programs: VA Plat, QF LTG / OW Sapphire; NZ Gold, HH Diamond, Hyatt Povo. Every time it happens, turn around and slap one of the parents. 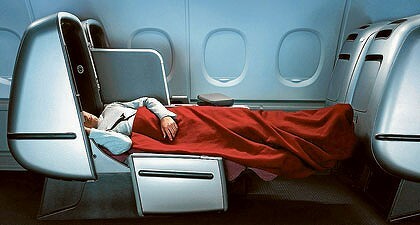 - Seat/Skybed is exactly the same on 388/744 (or should I move to the BA flight for better sleep) ? - The assigned seat is a good choice ? The Skybed MK II on the 388 is completely flat at 180 degrees, see http://images.smh.com.au/2010/05/18/...-set-420x0.jpg. Most people prefer the flat bed, but opinions differ. I prefer a flat bad so would consider BA, however CW is starting to look tired now. Service, catering and priority luggage are all superior on QF. 18A is private, but too near the UD galley for my liking. thanks for the quick answer. Kind of confirms my guess this might be a slight downgrade...will check BA. Question time please guys and girls. Today I returned to CHC after a couple of days back home in SYD. Its a trip I do a handful of times a years, 9 times out of 10 has always been on NZ. Due to the complicated frustrating LCC new transtasman program NZ has put in place, this journey, and all future ones will be on QF. I flew in Y on 737-800's. Nothing flash, no IFE, but certainly adequate. During todays flight I was weighing up foregoing Y altogether and doing all upcoming travel in C. I'm a member of BA and will decide later whether to credit travel to them or just use up those points and join QF's program. My question has to do with the business seats on the aircraft that do the daily CHC-SYD service. As I was disembarking today I noticed that the C cabin also didnt look to have IFE's!!! At least no personal screens in the back of any chairs. Can anyone confirm this? Someone please tell me that there are personal screens on the 738s, conveniently stowed away between the seats. While its not critical to have them for such a short flight when flying in C nowadays you should be able to expect that provided at the very least. Lack of them could end up being a deal breaker. On the new 738's the screens are indeed stowed away. It seems that this flight is not a Jetconnect operated 737-800, as they all have the new PTV AVOD IFE. So if this flight is operated by QF Mainline then this means that Business Class passengers will receive personal DVD players with a bi-monthly library. Guys thank you so much for your immediate input. It a few weeks before I do think trip again, already booked and will be another Y journey. I will be a big boy and ask the crew this time. Note that in the coming months the remaining Jetconnect 734 will leave the ZK fleet (one [ZK-JTS] is going back to Oz). These will be replaced with 73H's. All jetconnect 73H's have personal IFE for all passengers. There will still be the odd turnaround flights operated by VH 73H' - these should have the DVD's players for business class. I've upcoming business class flights MEL-CNS and CNS-SYD. First trip is on 737-8 and second on a 767. Do both of these have personal screens in business? Sorry, neither plane has PTV's in business (except for a few of the 763's in "international" format). All jetconnect 73H's have personal IFE for all passengers. Flew QF142 AKL-SYD in Y class over the weekend and was very impressed with the seat-back IFE system for all pax on the 73H. A huge improvement over the 734 facilities. Window seat in J A388 LHR-SIN, which side? For city view (London and Singapore, if any) which side should I sit, A or K?